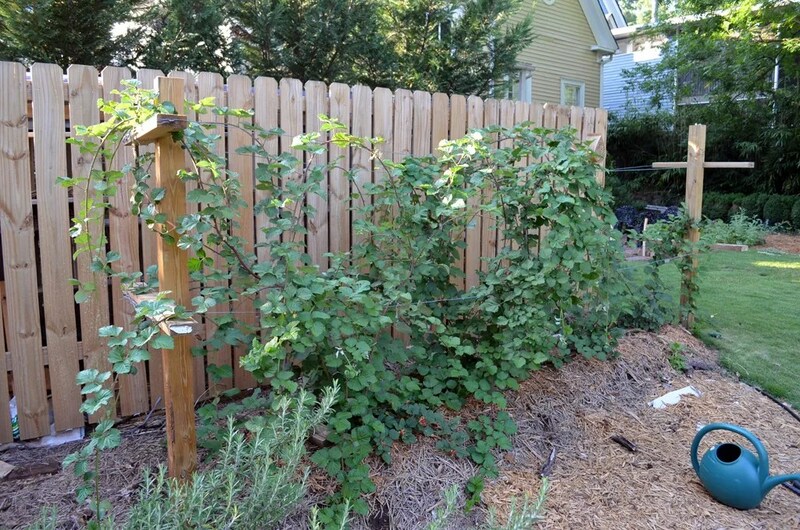 2012 is the first season with raspberry canes growing behind the fence. Into this bed four “Heritage” raspberry plants were tucked in along with mulch and a drip irrigation line to keep them happy. Following the somewhat vague guidance from various state agriculture bulletins, I constructed a sturdy two wire “T” trellis system for support. 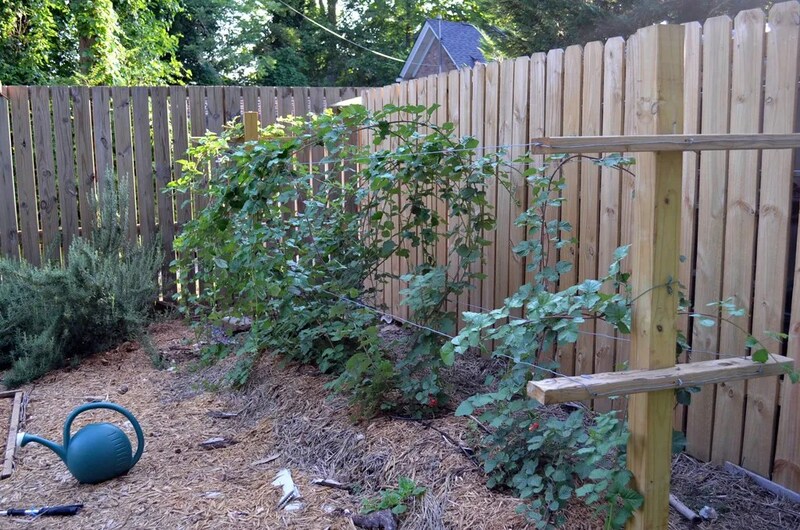 As the canes came to life, I searched for pictures showing what a bed of Heritage raspberries might look like inside of a properly dimensioned “T” trellis system. There were a few, but with the massive number of canes that come up in an established bed, the pictures just looked like a mass of modestly contained chaos. Once my new canes came up I panicked and lowered the height of both wires; now I am contemplating raising them again if I can. It appears that I significantly misjudged the ultimate length of the canes- I figured 5 feet might be about right but these just keep growing. I “tipped” the main canes two or three weeks back to promote lateral growth, which seems to be working well. Still, what a tangle of thorny canes. If anyone has experience with raspberries, especially “Heritage”, and the proper trellis system for them, I’m all ears. I curious to hear from someone with expirence as well. 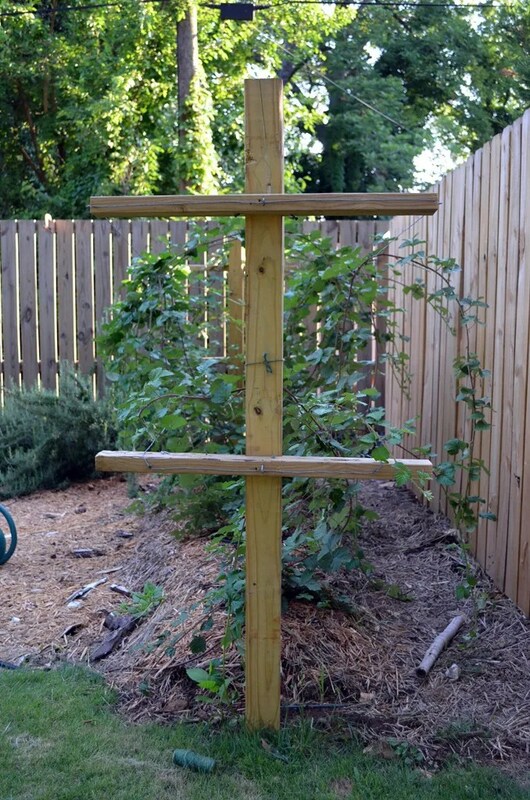 I planted six canes but have no trellis system at all. They produce good berries but it is one ugly mess. I think this is close to what I need per the various AG bulletins. I’ll cut to the ground in late winter and start over vs thinning and doing the primocane/floricane thing. from everything I’ve seen, this is exactly what you are supposed to do…. we are planning to try the same. I didn’t know raspberries were so gangly!! That’s good news. Hope you are right!